Offering a seasonal outdoor swimming pool, entertainment staff, a kids' club and a children's playground, Camping Écureuil Eldapi Vacances is located in the heart of Coubre Forest and free Wi-Fi is available in the self-catering mobile homes. There is also a shared TV room. Each accommodation has a terrace, a seating area with a sofa, individual heating and a private bathroom with a shower. They also have a fully equipped kitchenette with a dining area, microwave, kitchenware and refrigerator. In July and August, a supermarket is available 500 metres from the camping, and on site, there is a snack bar and a pizzeria. Guests can also buy fresh bread. An array of activities can be enjoyed on site or in the surroundings, including table tennis. Just 300 metres away, there are slides, a mini golf and upon reservation, a tennis court. 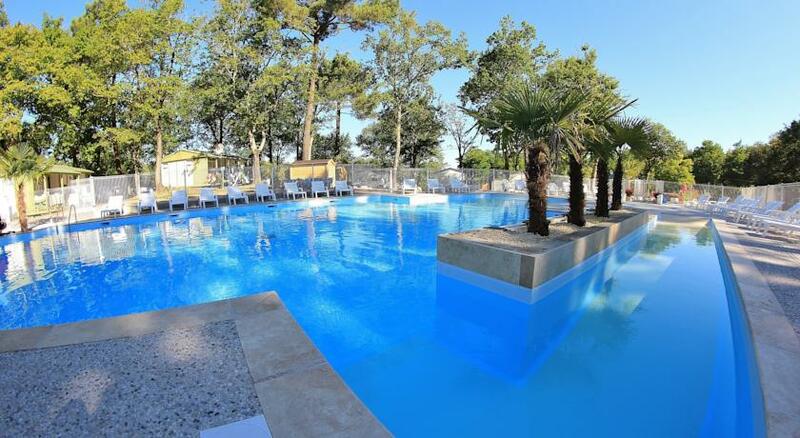 The property offers free parking and Royan is 11 km away. Posizione del luogo "Eldapi Vacances"